Ladies and gentlemen, boys and girls, step inside Mosco’s Traveling Wonder Show, a menagerie of human curiosities and misfits guaranteed to astound and amaze! But perhaps the strangest act of Mosco’s display is Portia Remini, a normal among the freaks, on the run from McGreavy’s Home for Wayward Girls, where Mister watches and waits. He said he would always find Portia, that she could never leave. Free at last, Portia begins a new life on the bally, seeking answers about her father’s disappearance. Will she find him before Mister finds her? It’s a story for the ages, and like everyone who enters the Wonder Show, Portia will never be the same. At one time, Portia had a family. Her father would listen to her stories, her cousins were lull her to sleep at night with their songs, and her Aunt would drag her to church on Sundays and keep her line. But things change, and in what seemed like the blink of an eye, Portia is sent to McGreavy's Home for Wayward Girls under the care of Mister, a super creepy bachelor who is building his own workforce of poor girls. Then Mosco's Traveling Wonder Show comes through town, and Portia sees freedom on the horizon and the hopes of finding her father. This is a sad story. That's not usually awesome, but Portia's sadness was real and heartbreaking, and the family she finds with the Wonder Show is equally real and heartbreaking. I've never dreamed of running off with the circus, but there's something familiar about her journey for freedom and her fear of the unknown. I like villains. The scarier the villain, the more I like them. It's not a "like" as in I want to be their friend, but a "like" as in a like to hate. That doesn't make any sense. Evil isn't fun, but it's interesting...from afar. Mister might just be the most intimidating, terrifying villain I've come across in awhile. He's so creepy that you are constantly looking over your shoulder, afraid that he's catching up to Portia. As I started the book, I was swept away by the almost mystical tone to Barnaby's storytelling. And it seemed just that, like someone was sitting down and telling me a story. As the book progressed, a bit of that initial attraction started to wain. The story took on a heaviness and strangely alternated voices that took me out of the story a bit. While the different perspectives, especially from the "freaks" in the Wonder Show, were interesting, they were too brief and didn't really add to the story. 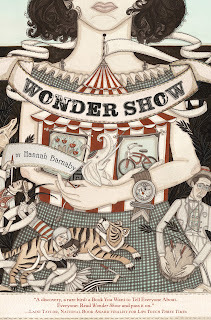 This is Hannah Barnaby's debut novel which is absolutely amazing. If you like coming-of-age stories, stories that break your heart and build you up, Wonder Show is an excellent choice.